I loved the movie The Hunt for Red October. It was the first movie that made me feel like a badass just for watching it, and began my obsession with reading any Jack Ryan book that leaked out of Tom Clancy’s brain. So when I saw that there was an SNES version, I jumped all over it. I should have probably guessed what was coming, as the plot of the film isn’t really conducive to a videogame, but I didn’t. It was sure to involve submarines, and high-stakes cat and mouse battles, buckets of tension, and all sorts of international intrigue… Well, err, at least the submarines are there. In the film, Sir Sean Connery plays a Soviet naval mastermind who is given command of Russia’s brand new, first-strike missile submarine the Red October. It’s so dangerous because of a new, silent propulsion system called a Caterpillar Drive. With a nuclear-capable submarine incapable of being detected, the Soviets gain a distinct upper hand in the Cold War. It becomes frightening for both sides when Connery cuts off all communication with his political masters, and starts sailing toward the United States. Toot toot. Defecting Soviet coming through. 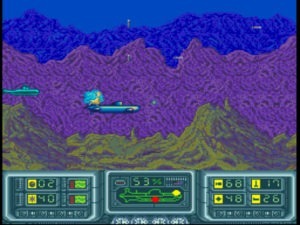 This is the first level of the game. That’s right, the entire movie is compressed into one short level where you cross the Atlantic Ocean like it was a backyard pond, with various subs and destroyers laying around lazily trying to stop you. The rest of the levels are spent working for the U.S. Navy, by taking your high-tech submarine around the world to stop drug dealers, pirates, and other naval chores. That’s dumb enough as it is, and I can probably stop my review right now, safe in the knowledge that no sane person would come near this game. But I haven’t even gotten to the gameplay yet. Red October is an underwater side-scroller. You pilot your expensive submarine around with on-a-dime course readjustments and instant diving/surfacing capabilities. 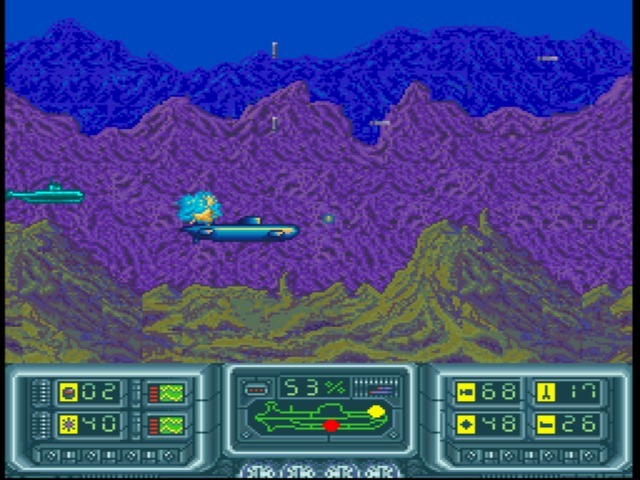 It’s basically R-Type or Defender, except allegedly underwater. Though you won’t really be able to tell a difference because none of the submarines handle like they’re underwater, i.e. slowly, sluggishly, and at the mercy of physics. There are no particular water effects within the levels either, except for a background that waves back and forth like the intro to a dream sequence. Your sub is armed with four basic weapons that shoot out in different directions. One is a missile firing straight up to deal with surface ships or subs above you. One is a torpedo firing straight ahead. The other two sink down to hit enemies just below you, or lob out to hit enemies ahead of you. It’s the hardest to aim and the least useful, though it did come in handy all of one time, when I was able to shoot it over a mountain at a sub on the other side. None of the weapons differ at all in terms of strength or characteristics, (there are no homing weapons or powerful ones meant for carriers), so it’s basically just an issue of figuring out where the enemy is and shooting the weapon that will go in that direction. Or you can just rush off toward the end of the level and win just as easily. My major problem was remembering what button shot what. Each payload is limited, so it doesn’t help to fire off the wrong kind of torpedo when you might need it later, or burn through all your “good ammo” so that you’re forced into maneuvering your sub into the one angle you still have shots for. Fortunately, these limits are all quite generous, and you can pick up more torpedoes and repair your ship through a cover-all pickup in the shape of a small, one-man sub like those in The Abyss. You can also activate some limited specials. One sends out a blast that clears the screen, the other is meant to be the Caterpillar Drive and “cloaks” your ship. You can move by enemies without getting spotted, but it chews through its power, or time limit, or whatever, far too quickly to use in anything but an emergency. Occasionally you will encounter an icon underwater that leads to a bonus stage. The view shifts to first-person, presumably looking through your periscope, and enemies fly around in gallery shooter patterns. They offer an opportunity for more types of enemies, or at least a different way of looking at the same ones. It also give you a chance to break out your Super Scope. You can do just fine with the controller pad though, and it is just a bonus stage so it’s all just for extra points. It’s a little piece of added value, I suppose, and your success or failure doesn’t have any real effect on the rest of the game. There’s an NES version of this, which looks supremely awful. At least here, you get some attempt at portraying an underwater world that doesn’t look like a blue screen and some pipes. There are craggy underwater mountain ranges that damage you continuously if you sit on them. There’s some background cliffs, and a few underwater caves. Yet the backgrounds, though they look good, get reused a bit too often; basically breaking out into “clear ocean” and “stormy junkyard” varieties. Enemies have clean, smooth angles to them, and a fair variety – which is an accomplishment considering every submarine by design is basically required to be a phallic tube with some fins on it. All enemies drive the same types of subs, so you’ll never see a difference between the pirate subs, the U.S. subs or the U.S.S.R. subs. You will at least encounter a couple different vessel classes, equal variety in the types of surface ships, and no ship that ever confusingly looks like your own. Some effort has even been put into making underwater explosions look unique, with some blue puffs of escaping air (I guess) and a little more of an implosion look than a simple jaggedy orange fire sprite that would look out of place. Everything close to and above the surface looks a little more dull, with a clear blue sky and not a lot of detail or distant landmarks. But to be fair, it is the ocean. The biggest issue with the game, hands-down, is that I really don’t think the designers even watched the movie. Someone came into a staff meeting, said the phrase “make a game based on this submarine flick,” and then left without giving them any more direction. The result is a submarine game indeed, that has next to nothing to do with the film it is based on. It doesn’t even act as a possible sequel. It’s just nonsense that cross-promotes with the movie, because they both happen to involve underwater combat. You can see this most clearly in the gameplay, and it is nothing more than a 5-6 level maritime scroller. The music further clues you in, by being bright and upbeat, “Russian-sounding” themes. Not a trace of the somberness or tension or fear from the movie exists; you just chug along and blast pirates. The first level rush-through of the film plot suggests that they wanted to get it out of the way so they could get on with their own submarine shooter. That’s fine, I suppose, but why claim the license if you’re going to piss it away? If you came to this expecting something like the movie, you’ll feel betrayed. This is an easy cash-in. It snubs the license that could have made it something more than an average shooting scroller, but that’s what you’re left with. 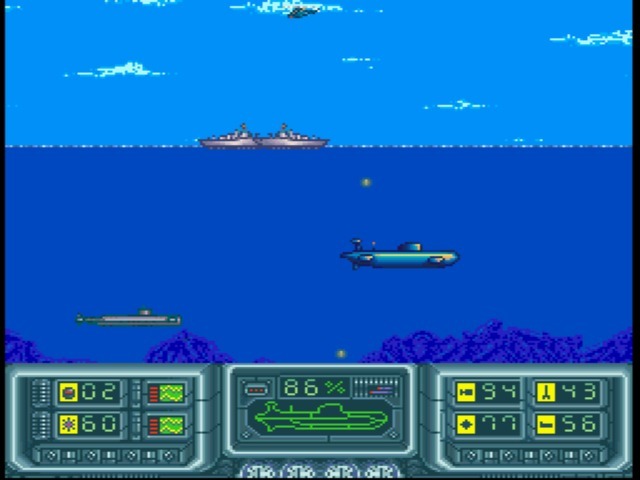 Play 688 Attack Sub if you want a good submarine sim, play R-Type if you want arcade action, and watch the movie or read the book if you want Red October. Just don’t go near this game. It looks better than the NES version. Lame scroller feeding off the scraps of the movie rights.